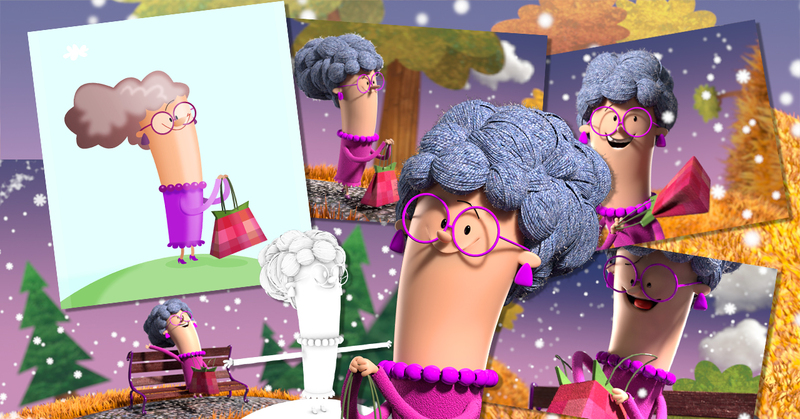 Woolly Package is a slick 3D sting starring Aunt Fanny. She’s a sweet old dear with an extremely wicked side, who knits a thoughtful gift for her fancy man. We conceived and developed everyone’s favourite Aunt for a series of quick-fire shorts, full of misdirection and cheeky humour. The renowned E4 competition seemed like the perfect opportunity to introduce Aunt Fanny to a wider audience. We created a highly polished animation that kept the quirky sensibilities of the original 2D concepts. The resulting visual style creates a CG/stop-motion hybrid feel. #E4Package has won the prestigious Judges Choice award. Our ten seconds of chuckle-some fun pipped hundreds of entries to make the shortlist. In a TV campaign, we fought head-to-head battles with other contestants before being knocked out in the semi-final by the eventual Public Choice Award winner #E4City. Fortunately however, we did go on to win the coveted Judges Choice Award. Now equally proud and fond of our Aunt, Woolly Package will be seen by millions as it airs regularly on E4 throughout 2016.